Load the album When I Woke, track one. Thoughts: I love this top! There’s pretty much nothing to it. It’s knit in the round with the 15 stitch lace panel. Throw some ribbing on it and you’re ready for rockin’ out before you know it! This bad boy had to be ripped out right around the end of the sleeve area because I had been following the directions wrong… but I’m happy I did and stuck with it. 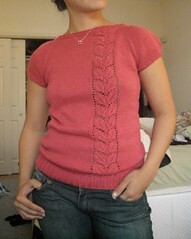 I didn’t make any modifications but might change up the leaf pattern if I did knit this again. (I have a sick amount Brown Sheep CF so it’s possible I will be doing another in a different color… then again they’re always Green Gable.) I did the shaping as stated for the 2nd size up and it fits like a glove. continue on to track two… Ecstasy. we got the tools, we got the talent! Woohoo!!! It looks fabulous and you have no idea how happy it makes us that you made the connection to the band!!! Rock on! that came out great and fits perfectly! You could make it such a versatile pattern – just change up the panel for another stitch pattern! Looks fantastic! When I lose some weight, I’m totally going to make one of these! I love this top! You did a great job and it does fit so well. It’s now a must knit for me. Thanks! 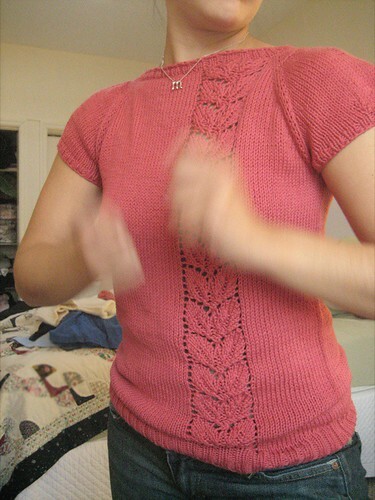 Congratulations on finishing your top — it not only looks great, but fits beautifully. Wear it with a smile! I love your Rusted Root! And it looks fantastic on you. It gives me hope that one of my girls (18, 16 and 15) will wear it when I knit mine.